Fans of many genres including classical music, concert band and jazz will love this clarinet Christmas ornament that is part of our popular musical instrument ornaments category. It is handcrafted from wood and metal with such authentic detail that you might be tempted to try playing a Mozart concerto or Duke Ellington swing piece with it. At more than 6" long, it won't get lost among the boughs, lights and other decorations. 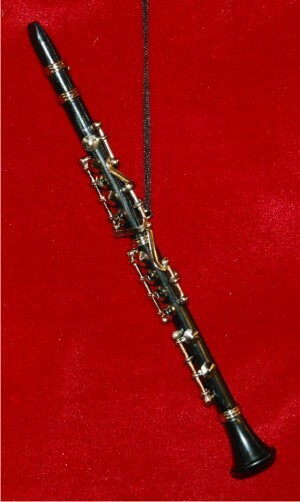 We send this richly designed clarinet ornament in our exclusive black velvet drawstring bag that is perfect for storages or presenting to the music lover, student or teacher in your life. gift for my music teacher Sep 27, 2014 Jack D.
gift for music teacher Sep 26, 2014 Freida K.